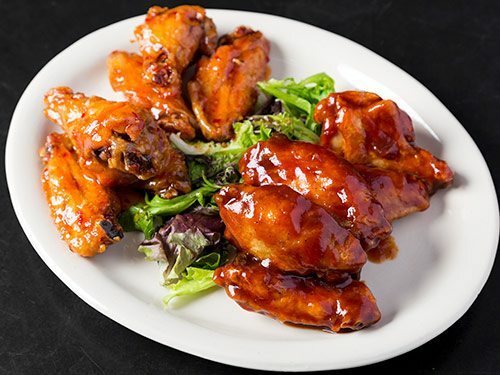 Beer Works Wings & Tenders are available with any of our amazing housemade sauces: Scorned Woman, Mild or Hot Buffalo, Sweet Thai Chili, Real Ale Honey Mustard, Blueberry Habanero, or Stout BBQ. Crispy fries topped with cheddar jack and crumbled bacon. A GIANT Bavarian pretzel served with mustard sauce and beer cheese dip. Part of the proceeds will go towards the future Park Street Playground. Delicious crispy fried green beans served with zesty ranch sauce. Deep-fried Maine potato skins stuffed with lobster mac and cheese toppped with crumbled bacon. 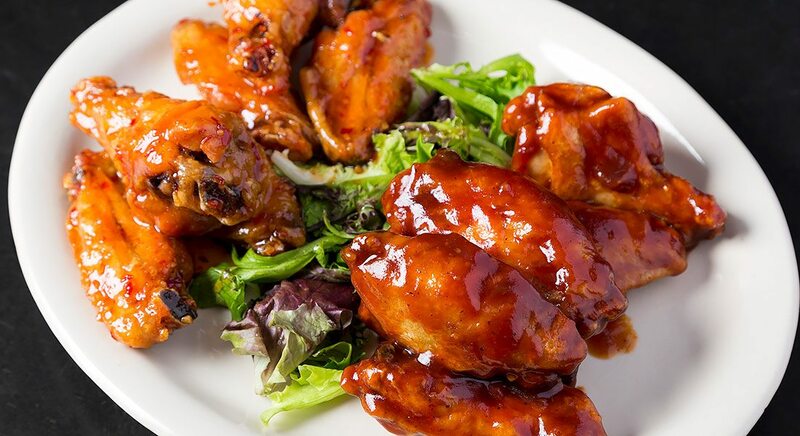 Available with any of our amazing housemade sauces: Scorned Woman, Mild or Hot Buffalo, Sweet Thai Chili, Real Ale Honey Mustard, Blueberry Habanero, or Stout BBQ. cup of clam chowder, fries, and a lobster roll. 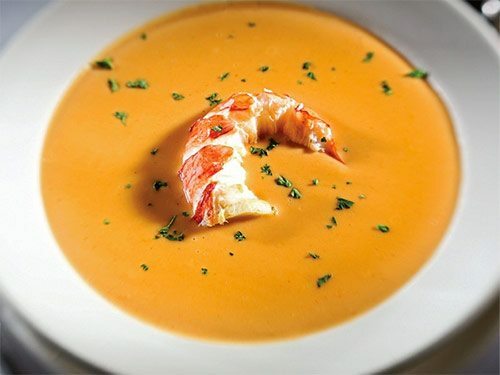 single or twin Maine lobsters served with drawn butter. 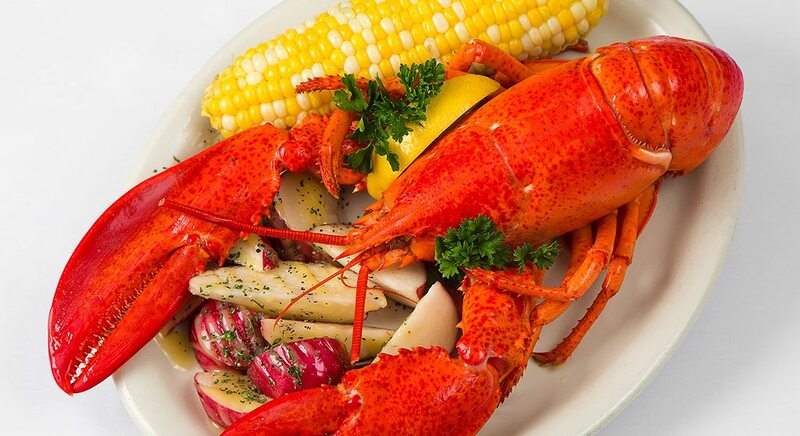 fresh picked Maine lobster served with lettuce on a toasted bun. All our hand-made burgers are 100% angus beef mixed with our special blend of herbs and spices. Served on a brioche roll with a side of chips and a dill pickle spear on the side. All selections are also available with a grilled chicken breast or veggie patty instead of a burger patty. Sweet and smoky bacon jam with crumbled bleu cheese. Smoky bacon, Humpty Dumpty BBQ chips, beer cheddar and mustard and BBQ aioli. Grilled pepperoni, mozzarella cheese & sun-dried tomato aioli topped with garlic crouton crumbs. 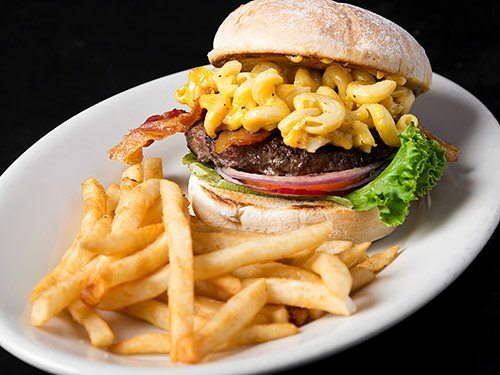 Our handmade patty topped with your choice of cheese American, mozzarella, swiss, or cheddar. Served with lettuce, tomato and onion . Made with ground beef, beans, roasted peppers, onions and packed with flavor. A slice of iceberg topped with blue cheese crumbles and dressing with crumbled bacon, shaved red onion and a drizzle of balsamic glaze. Fresh clams, potatoes and onion with a blend of herbs. Mixed greens, cucumbers, shaved onions and tomatoes with your choice of dressing. Fire-roasted tomatoes, red peppers, garlic and fresh basil. All sandwiches served potato chips. Thick cut bacon with fresh tomatoes and lettuce on toasted sourdough with light mayo. tender pulled pork, with house slaw, bacon, shredded cheese and a stout BBQ sauce. Roasted beer can chicken with onion, celery, craisins and candied pecans. Served on toasted bread with lettuce and tomato. Fresh haddock dipped in our beer batter with a toasted bun, lettuce and a dill pickle tartar sauce. Two Maine style dogs served on a toasted bun with sautéed onions. Sun-dried tomato wrap with house made falafel, lettuce, tomato, onion and tzatziki sauce. A really sloppy joe served with a fork and knife. #1 French Bread Pizza Garlic butter, marinara, mozzarella & basil. #2 French Bread Pizza Garlic butter, marinara, mozzarella & pepperoni. #3 French Bread Pizza Garlic butter, marinara, mozzarella, peppers & sausage. With baby spinach, crumbled beer cheddar cheese, fried onions, tomatoes and cucumbers wit blueberry balsamic dressing. 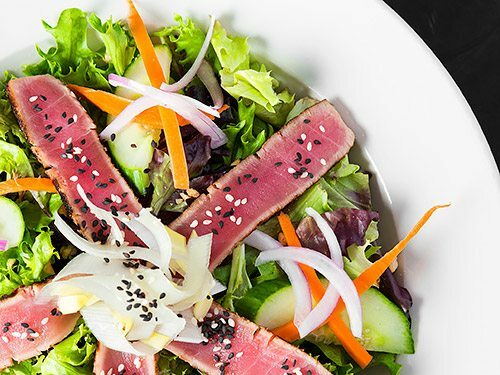 Five-spice seared tuna, mixed greens, cashews, red onion, cucumber, julienned carrots, leeks, and a sesame vinaigrette. Romaine Lettuce, cheddar jack cheese, croutons, cucumbers, onions, roasted corn and tomatoes with a spicy southwest ranch dressing. topped with bacon jam and fried onions. Served with garlic mashed and veg. of the day. 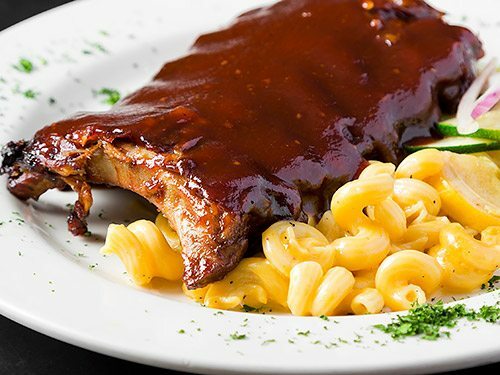 A full rack or half rack rubbed with a special blend of seasonings, roasted low and slow, then topped with our stout bbq sauce. Served with mac’n cheese and vegetable of the day. Crispy fried chicken with roasted garlic mashed potatoes and white country gravy and vegetable of the day. A made from scratch stew with tender beef, vegetables and a scoop of roasted garlic mashed potatoes. A beer battered piece of fresh haddock fried golden brown and served with fries and our dill pickle tartar sauce. savory meatloaf wrapped in bacon with a whiskey mushroom gravy served with garlic mashed and veg. of the day.